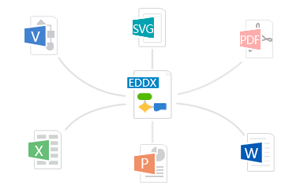 Edraw Max can simplify the creation of over 200 types of diagrams, empowering even novice users to build professional-looking and presentation-quality graphics. It helps to visualize information, enhance understanding and promote communication for better decision making. With diversified libraries and over 6000 vector symbols, drawing is easier than ever! Get started quickly with the extensive templates and examples, new and updated shapes, and out-of-the-box drawing tools. There are dynamic user guides within the software showing automatically. 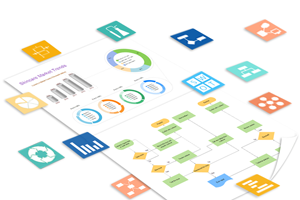 Together with the easy-to-use interface and in-built templates, even novice users can create professional and great-looking diagrams instantly. Therefore, Edraw has become one of the most popular diagramming solutions, gaining over 6 million downloads. Added the Pan/Hand tool. Simply hold down the right mouse button to pan your canvas freely. Added inserting QR code function. Added screen capture feature. The captured image can be inserted in your drawing right away. Added the feature of setting default font. You can choose "Use default font instead of theme font" in the Option menu. Improved the effect of PDF and Word export, solved the text misaligned issue. Added lauguage changing feature. Now you can change the UI language directly from Option menu. Added and improved more wireframe symbol libraries including website wireframe elements, wireframe icons, iOS icons and Andriod wireframe icons. Added more wireframe templates. Added Genogram symbols and templates. Added plenty of science diagram examples and templates for K-12 education. 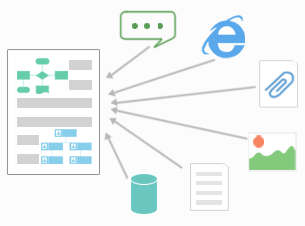 Added cliparts for Internet of Things, Smart Home, Big Data, Artificial Intelligence, etc. Added exquisite templates for arrow diagram, block diagram, 3D diagram, circle diagram, list diagram, pyramid diagram, venn diagram, timeline and presentation. 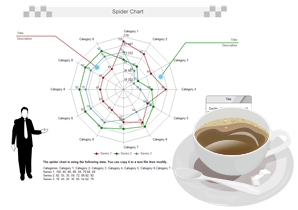 Added exquisite templates for business diagram, fishbone diagram, matrix diagram and marketing diagram. 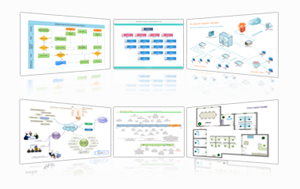 Added symbols and templates for enterprise architecture diagram design. Improved templates for business card and holiday card. Added templates for flowchart, mind map, floor plan, seating plan, fire escape plan, etc. Added templates for flyer, poster, picture collage, book cover, annual report, banner, etc. Added symbol library and templates for Graphic Organizer design. Added cliparts for business scene, festival, food, beverage, landscape, trees, sport elements, fitness,fashion items, biotechnology, etc.